As we dive into this new year… 2017 lingers in our minds from the lessons learned. Certainly, a year to be remembered. The lessons will linger. Many in fact. It was a tough year, that’s undeniable. It will, without question guide us in many ways, consciously and unconsciously, to live our lives with deeper conviction than before, and to ultimately slow down, and savor the simplicities of the moment. To begin with, we lost the patriarch of our family in early January of last year, Justin’s father, grandpa, and the man who began with a dream at Garden Creek. James Stewart Miller – passed away the morning of January 26, 2017. He lived a tremendous life, with his legacy living on today. 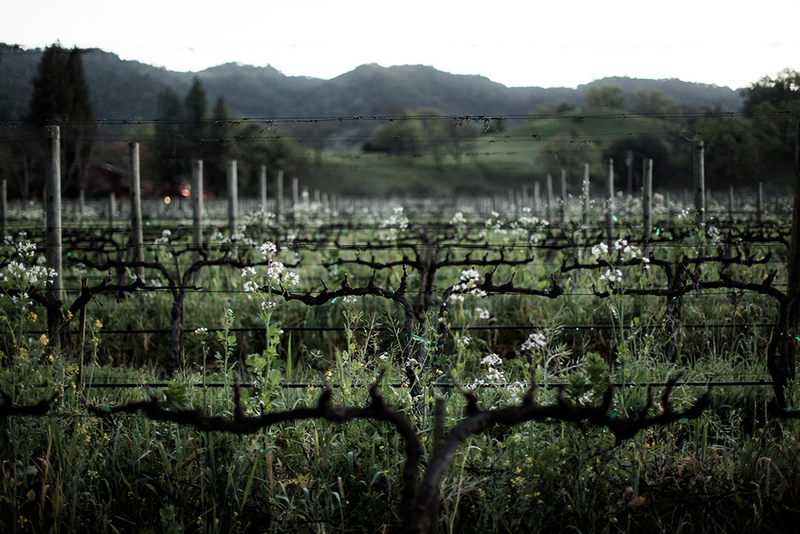 The vines we tend to, are the very ones first planted by the hands of he and Justin’s mother, 49-years ago. The orchard and citrus trees are even older. The true beauty of handing down a farm, a vineyard… the legacy continues to grow. If you have ever lost someone, specifically a parent, the loss brings much more than expected. And challenges, in fact. And then, there was the fire storm. One does not know what a disaster is until you have ultimately lived through one. 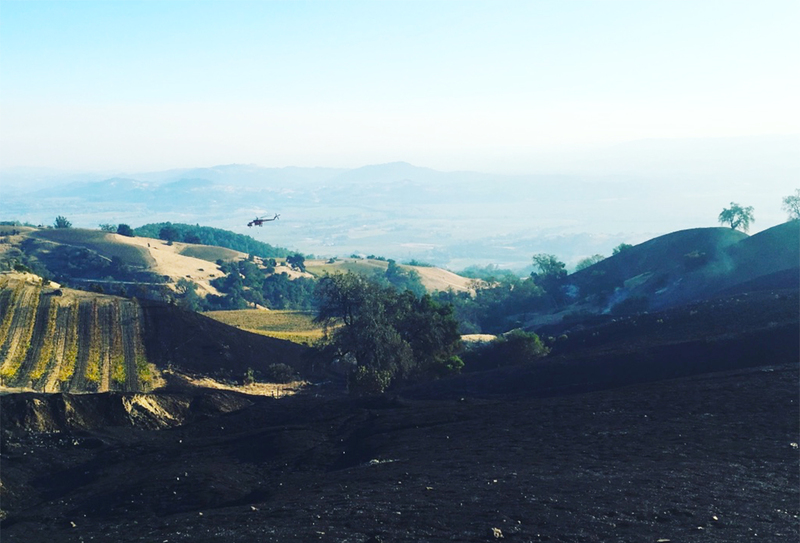 The fire storm that hit us on the night of October 8, 2017 in both Sonoma and Napa counties– was an unbelievable experience for us all. The scars are healing, yet the vulnerabilities in our hearts linger. We have shared a rental house on our ranch with a family from our school who lost everything – they arrived at our door with literally the clothes on their bodies, yet with a smile to be alive. Think of that. Each day as the fires roared around us in the mountains, heavy thick smoke sat inverted in the valley floor, the winds hollowing with burnt particulates and ash falling from the sky, and fire truck after fire truck were the only ones on the road – we were fighting one of the fiercest fires in California history. It’s a strange feeling waking up each morning, if you slept at all --- thinking we must literally defend our lives, our home, our livelihood and our community, today again. It all went on for 9-days. And, then we lost our 2017 Tesserae red wine vintage. Too much smoke taint in the berries. The skins are permeable, delicate. The smoke had sat long enough to penetrate the phenolics. We would not, and could not compromise our wines, nor integrity in crafting wines of purity. Nor our ideals. Justin and I learned again-- in the strength of letting go. Knowing what to fight for, and what to let go of. All great triumphs, projects, businesses, even relationships -- grow stronger during adversity. These are the times we tend to make better decisions for the foundation and meaning of what we do. We learned a bit about ourselves, and our convictions have become stronger. And more clear in remaining true to who we are. The simplicities in life, being honest, humble, and to work hard each day with something you love and beside the one you cherish. Embrace life’s lessons with your arms wide open. Experience our family wines and vineyards at Garden Creek Ranch with a private Taste + Tour hosted personally by us. Each Taste and Tour includes a walk through our historic vineyards and then into the winery where you will taste our wines in the barrel room under candlelight. A plate paired with exquisitely aged cheeses and local charcuterie is included. -Justin & Karin; Proprietors, winegrowers & winemakers. Monday throught Friday: 10:30am or 1pm only. Please allow 90 minutes for the entire experience. Fee: $30 per person. The fee is not applied towards purchase. Limited to 6 guests. For larger groups, please inquire.